Loreta "Rita" Jo Jamison, 93, passed away on August 3, 2018, in Oklahoma City. Rita was born in Wichita, Kansas on February 7, 1925 to Russell Harlan And Vinita Viola (Jewett) Lyman. She attended East High School and obtained her bachelor's degree from what is now Wichita State University. Rita married Bill Jamison in 1947, and in 1968 they moved their family to Oklahoma City. Rita was a spunky, very energetic and vivacious woman who devoted her life to her faith and family. She was very active in church with Altar Guild, Mobile Meals, Stephen Ministries and much more. She loved gardening, dancing, golfing, swimming, musical theatre and playing or watching any and all sports. 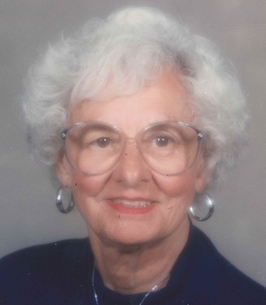 Rita was a diehard OU fan, attending all football, men's and women's basketball games and more. Rita is preceded in death by her husband, William "Bill" Andrew Jamison, both of her parents, Russell and Vinita Lyman and her brother Lewis Lyman. She is survived by her children Marcia Guggisberg (Jack), Nancy McIlvain (John), Steve Jamison (Rita), Mary Ann Summers (Doug) and Bill Jamison (Jana), her 15 grandchildren, Michelle Drouhard, Kirstin Wine, Jamison McIlvain, Amy Lovelle, Todd Guggisberg, Brodie McIlvain, Amanda Jamison, Abby Duran, Bret Guggisberg, Jessica Edwards, Drew Jamison, Sam Summers, Andi Jamison, Joe Summers and Jack Jamison. Rita also left behind 19 great grandchildren, Sally, Libby and Piper Wine; Riley and Carter Guggisberg; Saga, Elsa and Alma McIlvain; Alice, Anna and Helen McIlvain; Austin, Chance and Layne Lovelle; Ajani Jamison; Max Duran and Leah Summers. In lieu of flowers, memorial donations can be made to The Episcopal Church of the Resurrection, 13112 N. Rockwell Ave., OKC, OK 73142. A memorial service to remember Rita will be held at 11:00 a.m., Thursday, August 9, 2018 at The Episcopal Church of the Resurrection. To send flowers to the family of Rita Jamison, please visit our Heartfelt Sympathies Store. We encourage you to share any memorable photos or stories about Loreta. All tributes placed on and purchased through this memorial website will remain on in perpetuity for future generations.